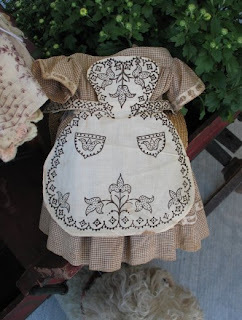 I watch as the lady from Denmark picks up the beautiful, haunting doll and walks to the table with it. 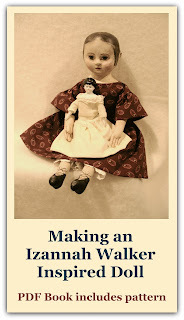 She checks out and walks to her rental car with the doll cradled in her arms. 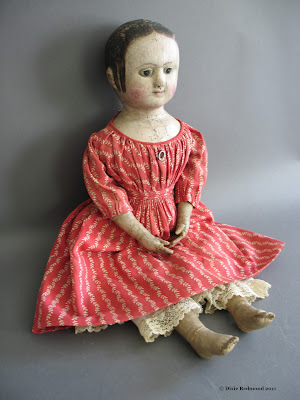 I see her strap the doll into the front seat, climb in a drive back down Old Washboard Road with one of the most beautiful dolls in the world. The auctioneer is pontificating again about the merits of a lot of EAPG glass. I'm not really interested, but since it's such a beautiful spring day, I decide to stay and watch the auction and have fun. I see a mounted moose head sell for $700, a box lot of old fashioned gartered girdles sell for $37.50, seven boxes of old books go for $300...the objects of others' lives moving on out into the world to begin another life. It's getting closer to the close of the auction, and there are only a few of us left as the sun is going down outside the barn. Tall Man is still there, and Harry, and myself and a few others who are mostly watching. There is a Linens Lady at every auction, and this one is no different. She looks sweet on the outside, but inside she is made of steel. If you even think of stepping into her territory she will make you pay and pay high. She and I have traded winning on lots all afternoon. We both have spent a bit more than we normally would have. The offerings are dwindling and I see that the Linens Lady has packed up her things to go home. Harry stopped bidding long ago, but Tall Man has been bidding high here and there on things that are of interest to him - mostly things like old tools and weapons and stuff like that. Most of the others are just interested bystanders. I have learned that if you are one of the last people at an auction you can snag some great bargains. It's how I picked up a $150 piece of Arts and Crafts pottery for $5. You can also buy a lot of junk. Out come a few more enamel pots and pitchers. A couple of hunting knives go to tall man for $1. And then the runners come out with a beautifully painted antique flat-top trunk. It is painted in and old blue and stencilled with a floral pattern. The auctioneer looks at the crowd of three bidders, looks at the trunk and then grouses to the runners, "Why didn't we bring this out earlier?" I turn to see if Linens Lady is still here just in time to see her driving away in her SUV that has a license plate that says LINENLADY. Yes, really. So it's down to Tall Man and myself. The auctioneer turns to us and says, "I pride myself on running an honest operation. That way we all win. If I didn't run an honest operation I would pull this thing and save it for another time. But I advertised I'd be selling everything and that it's fresh, and so here we go. You two have fun, but don't hurt me too bad, please. Boys, open that trunk and show this little lady what's in there." They open the top of the trunk and begin pulling out the wardrobe meant to fit the Izannah Walker Doll that the lady from Denmark walked off with. "Do I hear $300 for the stencilled antique flat-top trunk that is filled with antique doll dresses?" Auctioneer turns to Tall Man, "I have $300 do I hear $400?" "$400, do I hear $500?" Tall Man looks at me. Then he shakes his head. "Well, ma'am," the auctioneer sighs, "It's all yours for $500. You ma'am are getting the deal of the lifetime. There are 12 dresses and an assortment of other doll garments in that trunk, which by itself should get over a thousand." YES YES YES - I got an IW !! !